In 2017, Kick’n It For a Cause raised over 30,000 sneakers to fight the spread of deadly diseases in the Republic of Congo and Rwanda. 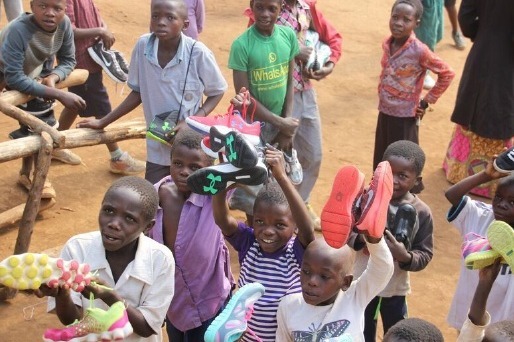 The first 10,000 sneakers were raised over a 2 year period with our partners at the Ntibonera Foundation. During a visit to my alma mater, Liberty University, I was made aware of Liberty student and former Congolese refugee, Emmanuel Ntibonera’s incredible effort to help save the lives of the people from his homeland. I founded Kick’n It simply because I’m truly passionate about sneakers but most importantly, I love how sneakers connect people from all walks of life. Through a successful social media campaign , similar to the ice bucket challenge we raised additional 20,000 sneakers including 500 sneakers from Under Armour, 500 from Nike and 500 from my good friend, Stephen Curry. Last July, we traveled to Rwanda to personally deliver the sneakers and it was an absolutely life-changing experience. We literally gave these people their 1st pair of sneakers. How dope is that? Although it felt amazing to have provided those sneakers, I quickly realized we can do and NEED TO DO so much more. We also provided food, medical supplies, clothing and other basic living necessities that we take for granted. Sadly, we didn’t have enough for everybody. What really drives it home for me is my relationship with Emmanuel, founder of the Ntibonera Foundation. He’s the mastermind behind this project because he was literally in those shoes(pun intended). What if through all of our efforts, we miss out on the next Emmanuel Ntibonera? That little boy or girl who can make this world a better place doesn’t have the opportunity simply because he was born in a disadvantaged situation. I just knew I had to go back. This year we’re headed back to Africa and we’re looking to raise 100K Sneakers and $100K to provide to a Ugandan Refugee camp with over 100K refugees. We are raising money to ship the crates of sneakers, travel for our team to Uganda and to provide food, medical supplies, clean water and basic living essentials for the refugees. Every donation counts. I’m personally asking you to donate what you can! I promise that with Kick’n It For a Cause you will get to experience the impact of your donations. PLEASE DONATE & SHARE the link below!